2 Original Vintage LALIQUE / PARIS / Sparrow Birds Statuettes / Frosted Crystal. THE QUALITY AND DETAIL ARE EXQUISITE! YOU WILL LOVE IT! THE BASE IS SIGNED "LALIQUE FRANCE". THE ONLY THING I CAN FIND UPON VERY CLOSE INSPECTION IS MAYBE A FEW MINUSCULE SCRATCHES. YOU WILL NOT BE DISAPPOINTED! Terrific pair of vintage Lalique France fine crystal bird or sparrow paperweights titled Moineau Colereux and Moneau Moquer. Both with inscribed Lalique signature, the head up measures approx. 3.25” tall and 4” long, the head down approx. 4” tall and 5.25” long. Compare new retail price of $400 each or $800 for the pair. Fresh from a fine old Denver estate, and offered with No Reserve. Condition is excellent overall, both showing light and minimal use. No chips, cracks, repairs, or other damage. Have a look at my other listings, I’m happy to combine shipping. Thank you for your bids and I strive for 5-STAR service. Stamped Lalique France. Bird preening his wing clear slightly frosted. 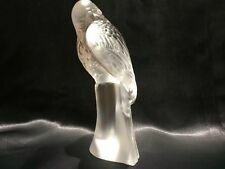 Rare Lalique Frosted crystal Owl Bird figurine W/clear base signed Lalique France. Superb. A Stunning Lalique Crystal Pheasant Bird Place Card Holder Paperweight. The Place Card Holder Is Signed On The Bottom. A Very Nice Addition To Any Collection! Baccarat French Crystal Passage Obelisk Created and Signed by Serge Mansau. Signed multiple areas, "Baccarat" "Baccarat France" "2000" "Serge Mansau 1161/2000.". It is a breathtaking work of art. Truly the rare trophy caliber masterpiece Baccarat is known for. Beautiful Large Baccarat Glass Art Millefiori Concentric Rooster Silhouette Paperweight with Original Box. Has a rooster centered cane followed by 17 other Gridel canes. Paperweight has Signature Cane with year "B 1971". Large Beautiful Baccarat Concentric Millefiori Gridel Bird and Animal Silhouette Canes Art Glass Paperweight. Has the Baccarat Insignia, marked with edition number "112" and etched with year "1975". This is for a lovely Signed 1979 Rick Ayotte Lampwork Art Glass Paperweight. Signed Ayotte 79. Bird on Branch. "Daum France". DRUM FRANCE. Material Glass. Product Information. Item Condition In excellent PLUS Condition.Perfect mint condition with no scratches, no fleabites, no cracks, no repairs, or no other defects. Lalique Crystal Love Birds (2 Columbes in French) Letter Seal Paperweight (Lalique product # 10605). See Photo. Perfect mint condition with zero defects. 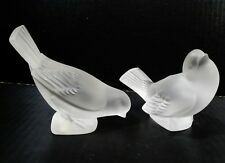 From a recent estate sale, this is a pair of wonderful signed Lalique sparrows. They are both signed on the bottoms with the acid etch mark. The sparrow with its head down has a small chip off the underside of one wing. The last picture illustrates this. Overall, they are nice and display beautifully! A Stunning Lalique Crystal Turtledove Place Card Holder Paperweight. Place Card Holder Is Signed On The Bottom. A Very Nice Addition To Any Collection! A Stunning Lalique Crystal Partridge Bird Place Card Holder Paperweight. The Place Card Holder Is Signed On The Bottom. A Very Nice Addition To Any Collection! LALIQUE PAIR OF LOVEBIRDS. An endearing pair of lovebirds touch noses in this fine crystal sculpture by Lalique. with Original Box. Sparrow Bird Head Under Wing. Height: 3" / Width: 2.8" / Length: 5". 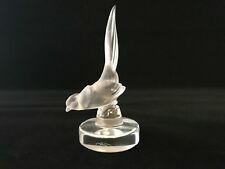 Lalique France Crystal Turtle Dove Bird Place Card Holder Paperweight DESCRIPTION:The is in very good vintage condition.small scratches on base from normal use overall the piece is in Good condition with no chips or cracks NO BOX INCLUDED. Measures:The Turtledove Is 3" Inches Tall And The Base Is 2" In Diameter The ITEM being pictured in this listing is the exactly the same ITEM you will receive.Please inspect the pictures for the condition purposes as they are the best indication of the condition -Please see photos for details -For questions please feel free to message me -Please Brows our page for other great listings! Signed "Lalique France" on the bottom of the base. Base has a very small fleabite on the corner by the signature. There is a very small chip on the bottom of the wing's corner that is only visible from the bottom view of the bird. EN CRISTAL DE BACCARAT GRIDEL FAISAN. FRENCH PAPERWEIGHT BACCARAT. millefiori and pheasant. EN PARFAIT ETAT. MINT CONDITION IN BOX. 2.2 " IN HEIGHT. I'M PROFESSIONAL. We do our best to correctly represent the condition and color of each item in the photos but keep in mind monitor screen colors can differ. This is a signed Baccarat pigeon dove bird figurine. The glass is wonderfully clear and this is a solid heavy peace and assigned on the flat polished base "Baccarat" with acid stamped logo. It measures 5" from nose to tail, and 2 3/4" high. It is an excellent condition with no chips or cracks. Baccarat Clear Crystal Turkey Paperweight. Condition/Info: Excellent, no issues. Light effortlessly rolls through this high quality crystal piece designed by world famous Baccarat. Beautiful detailing in the Turkey's open fanned tail. "YOU ARE PURCHASING EITHER PAINTINGS, PRINTS, WATERCOLORS". This sparrow paperweight by Lalique is a part of the ongoing Lalique Figurines and Paperweights collection. It features a frosted glass sparrow with wings extended. This crystal paperweight is previously owned and in excellent condition, showing no prior signs of use or wear. 6" length. Very good condition, no damade. THIS IS A VERY FINE PIECE OF "BACCARAT,FRANCE " CRYSTAL OWL.ETCHED ON THE BOTTOM AS SEEN IN THE PICS.THIS PIECE IS 4 " TALL . Stunning Crystal Owl Paperweight Sculpture. The famous house of Daumdates back to 1878. Daum is at the forefront of luxury crystal manufacture. Using rare and ancient techniques to create their iconic pieces, they specialize in the pâte de cristal process to form their instantly recognizable designs which have been celebrated for over a century. Authentic Lalique France Rapace cachet owl #10602. This frosted crystal standing owl paperweight has intricate details on a clear crystal base. Preowned and in excellent condition. Does not include the origional box. Beautiful Lalique paperweight. Sparrow with Wide Wings. Item is in original box. Code: 1163300. Side is signed "Daum France". Up for your consideration I have an authentic Baccarat Crystal Turtle Dove Paperweight in excellent pre-owned condition. No visible scratches - not even on the underside. Acid etched on the underside with the Baccarat France logo. Tete de Coq (Cockerel Head) is heavy crystal, realistically and beautifully detailed, in clear and frosted glass. Up for your consideration I have an authentic Baccarat Crystal Parrot Paperweight in excellent pre-owned condition. No visible scratches - not even on the underside. Acid etched on the underside with the Baccarat France logo. It is etched on the bottom Sevres France. Hirondelle - Swallow. (See below). Beautiful Lalique Swallow Bookend - Paperweight. THE PERFECT GIFT FOR THE LALIQUE COLLECTOR! This masterpiece is signed in script.